Where in the world is Harry Potter Wizarding World? For any Harry Potter fan, the ultimate holiday has to be a trip to Harry Potter World. Just imagine walking through a wall onto platform 9 3/4, drinking butterbeer at Hogsmeade, shopping for wands at Ollivander’s and feasting in the Great Hall at Hogwarts. The Wizarding World of Harry Potter is part of Universal Studios theme parks. But – Harry Potter World is NOT at every Universal Studios. Sadly. We wish it was. Harry Potter World has three locations: Osaka Japan, Los Angeles California USA and Orlando Florida USA. London does have a Harry Potter attraction. But it is not the Wizarding World of Harry Potter. Read on – we will explain. Osaka is the closest Harry Potter World to Australia. Families can fly direct to Osaka on Qantas. Flights on JAL and ANA go via Tokyo. Flights on Jetstar have a stopover in Cairns or the Gold Coast. Harry Potter World is one of nine lands in Universal Studios Japan. 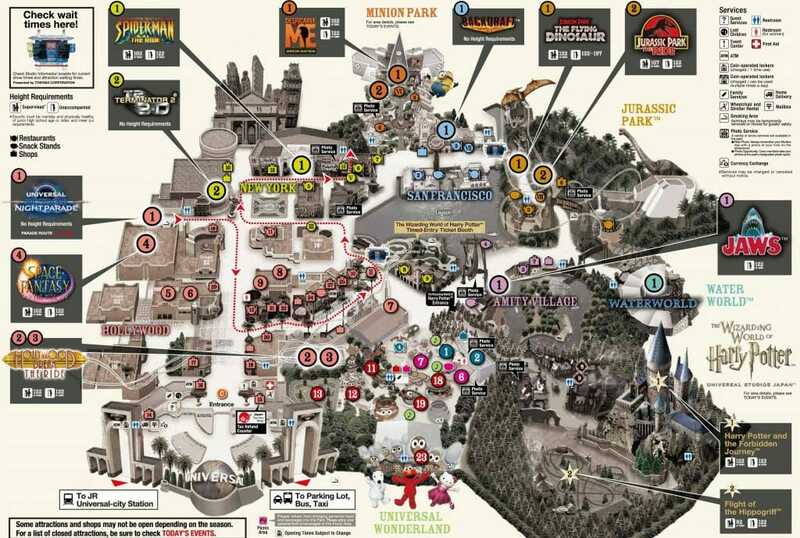 The others are Hollywood, New York, Minion Park, San Francisco, Jurassic Park, Amity Village, Waterworld and Universal Wonderland. To get to Harry Potter world from downtown Osaka, catch the JR Yumesaki Line train to Universal City Station. This trip is covered by a Japan Rail Pass. The entrance is a five-minute walk through the Universal City Walk. Harry Potter world has three sections: Hogwarts, The Flight of the Hippogriff rollercoaster and Hogsmeade Villiage. At Hogwarts, Harry Potter fans can sit in Dumbledore’s office, find the portrait of the Fat Lady and step into the Defence Against the Dark Arts classroom. Hogwarts is also home to the Forbidden Journey ride. In Hogsmeade, expect to see all the shops packed with Harry Potter merchandise. Grab a wand from Ollivander’s and cast spells at the shop windows, the stone walls and the back alley. Speak slowly as you wave your wand. Kids can make snow fall and water flow from a cauldron. Be patient. If it doesn’t work first go – keep practising. 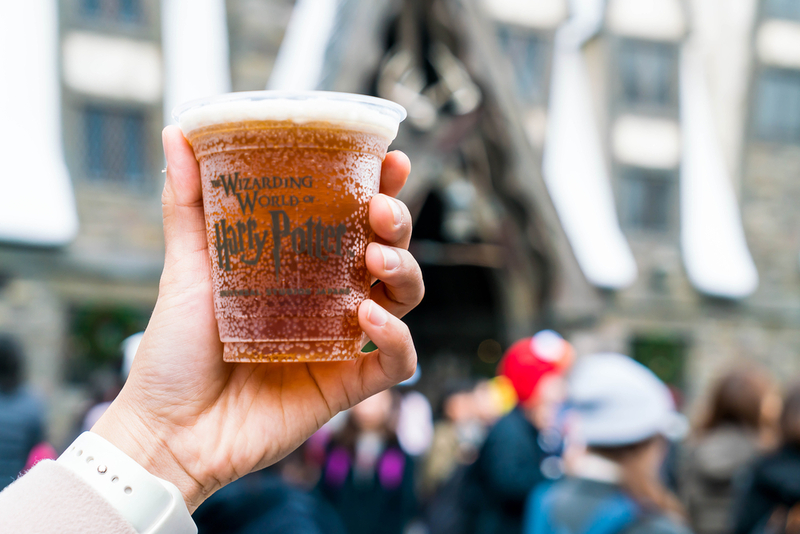 Head to the Three Broomsticks for a taste of Butterbeer. This sweet non-alcoholic drink can be enjoyed by the kids too. Make sure you also stop at Honeydukes to try Bertie Bott’s every-flavoured beans. The best ride is Harry Potter the Forbidden Journey. The motion-based dark ride was upgraded in March 2018. It has been named the world’s number one ride for five consecutive years. Pop on your 3D glasses and you will become immersed in the world of Harry Potter. Expect to feel the dragon’s heat and the chill of the dementors. The ride’s movements are synchronised with the visuals to give you a full 360-dimensional experience. We can’t tell you too much because it will spoil the ride. Children must be at least 122cm tall to ride. 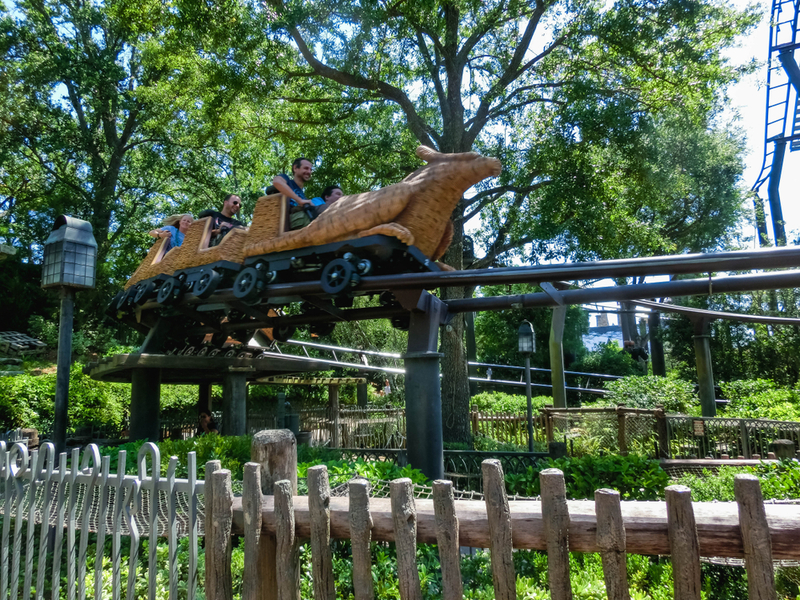 Flight of the Hippogriff is a wonderful family-friendly roller coaster. The backstory is that Hagrid is teaching young wizards how to fly a Hippogriff by using replicas of the creature. Kids must be taller than 92cm to hop on board. Expect to dive through the pumpkin patch, fly over the Forbidden Forest and swoop past Hagrid’s hut. TOP TIP: Universal Studios Japan opens at 8.30am. But if you purchase a VIP wristband you can enter the park early, before the crowds from 7am. This is great for families. We all know kids love to wake you up at dawn. Purchase the wristband from Abeno Jarukas 300 observatory the day before your park visit, or through Voyagin. Is it in English? Yes. It is. Don’t panic. You don’t need to learn Japanese. Buy an express pass. These allow you to skip the lines for popular attractions. You can buy express passes for three rides, four rides or seven rides. Be warned the park has a limited number of express passes and they sell out quickly. You will need to buy them in advance. We highly recommend booking at least 2-3 weeks before you go. Families need to organise a timed entry ticket to the Wizarding World of Harry Potter. The tickets are free. It allows Universal to manage the crowd sizes. If you purchase a Forbidden Journey express pass you will get entry to Harry Potter World included. Before you book your trip, do some research. This park seems to be the least crowded on Tuesday through to Thursday from early April to late June and November through to January. Avoid silver week and gold week. Florida is a long flight from Australia. But it is so worth it. Orlando Florida has the biggest Harry Potter world. Most Australians fly to Los Angeles and connect on a flight to Orlando. Qantas passengers can also get to Orlando Florida via Dallas Fort Worth. The flight time is about 20 hours. Universal Studios has a shuttle bus which takes passengers directly to the theme parks and hotels. 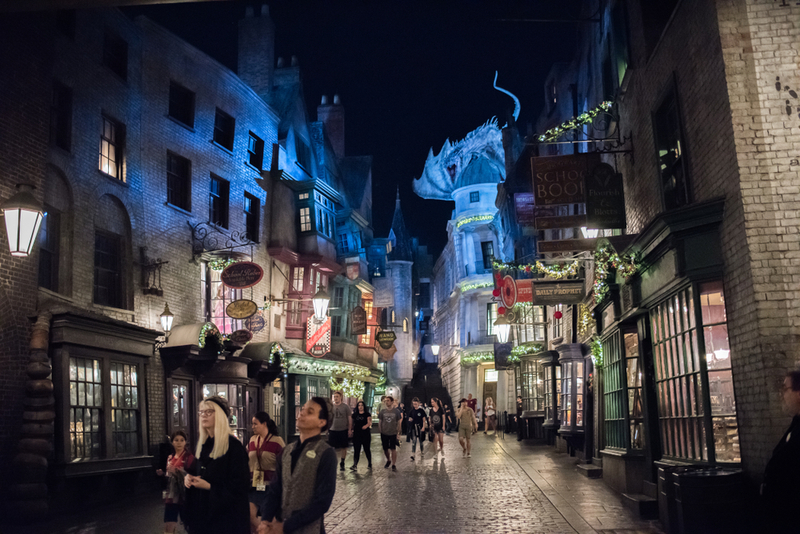 The Wizarding World of Harry Potter Orlando is split into two worlds – Diagon Alley and Hogsmeade. Diagon Alley is in Universal Studios Florida and Hogsmeade is in Universal Islands of Adventure. 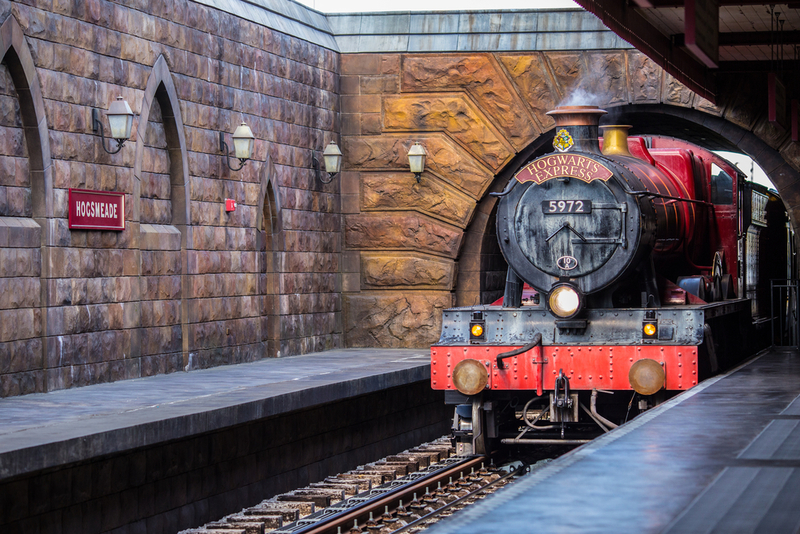 Families can travel between both lands on the Hogwarts Express. To do both you will need a park-to-park admission ticket. To catch the train, go to London at Universal Studios. Once you enter Kings Cross Station you need to walk through the solid brick wall onto Platform 9 3/4. Keep a look out of the window as you ride the train – you never know who you will see. Diagon Alley is home to the Leaky Cauldron, Ollivander’s wand shop and Gringotts bank. Young wizards and witches can buy a wand at Ollivanders and use it to cast spells throughout both Diagon Alley and Hogsmeade. The walls of Ollivanders are packed from floor to ceiling with wand boxes. If you’re lucky, a wand will pick you. Wand prices range from $25 for a toy learner wand to $48 for the interactive model that triggers the special effects in Hogsmeade and Diagon Alley. Diagon Alley is a cobblestone wizarding alley behind the Leaky Cauldron Pub. Each of the items on the Hogwarts school supply list can be bought here. According to Harry Potter fan websites, you can’t leave Diagon Alley without a scoop of butterbeer ice cream. Kids should also try to catch the fireworks inside Weasleys Wizard Wheezes. Adults should also taste the Fishy Green Ale at the Leaky Cauldron. Or at least the Tongue Tying Lemon Squash. Gringotts Bank has the Harry Potter and the Escape from Gringotts ride. Kids must be at least 122cm to ride this 4D experience ride. The ride has wheelchair transfers. To enter the bank, you must pass under a massive fire-breathing dragon. But that’s nothing compared to the escape. Expect to see Harry, Ron and Hermoine as you attempt to evade Bellatrix, Voldemort and goblins. Hogsmeade and Hogwarts are inside Universal’s Islands of Adventure theme park. Take a quick look at this video of the stars of Harry Potter on their visit to Universal Studios Orlando. Plan your trip here so you can stay for the Nighttime Lights show. The four Hogwarts houses are celebrated with spectacular projections across the school as the film music rings out through the village. Check the times for the shows online. They are not on every day. 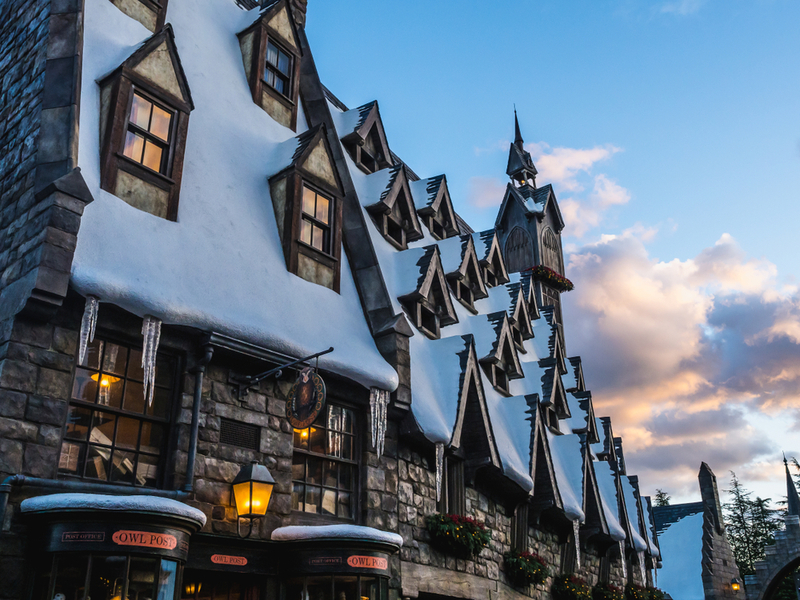 Families can dine at the Three Broomsticks, swoop past Hagrid’s hut on Flight of the Hippogriff roller coaster, and shop for sweets at Honeydukes. Inside Hogwarts kids can wander through the classrooms and corridors. Take a ride on the 4D Harry Potter and the Forbidden Journey if you are brave enough. The best ride in Hogsmeade is Harry Potter the Forbidden Journey. This is the same ride you can experience in Osaka and California. Pop on your 3D glasses and you become immersed in the world of Harry Potter. You will feel the dragon’s heat and the chill of the dementors. The ride’s movements are synchronised with the visuals to give you a full 360-dimensional experience. Children must be at least 122cm tall to ride. Flight of the Hippogriff is here too. Kids must be taller than 92cm to ride this family-friendly roller coaster through the pumpkin patch and past Hagrid’s hut. 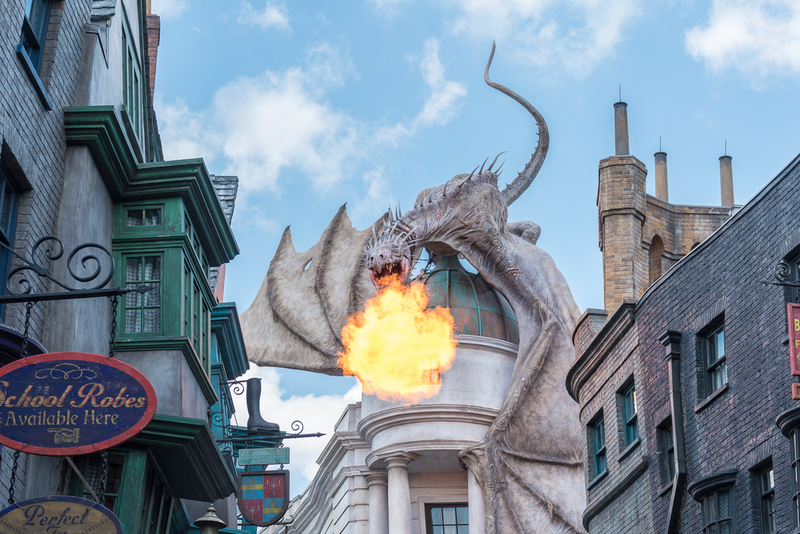 So really, the bonus of heading to Orlando is that you get a third ride – Escape from Gringotts, you can explore Diagon Alley and you can ride on the Hogwarts Express. Orlando Florida can be hot. Huge storms can roll-in in the afternoons. They don’t last long. Take rainjackets for the kids. Bring sandals – soggy sneakers are not fun. Butterbeer costs $6.99. If it’s really hot, get it frozen. Buy the express pass. You won’t regret it. You can skip the lines of the attractions you really want to ride. 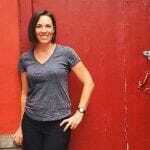 Check this link for the types of passes. We highly recommend spending that little bit extra to get the unlimited fast pass if you are travelling with kids. Orlando is huge. Wear comfortable shoes and clothes. Take your time. Don’t rush. Plan extra days and perhaps combine Universal with a trip to Walt Disney World. California is easy to get to. Flights from Sydney, Melbourne and Brisbane go to Los Angeles daily on Qantas, Virgin Australia, Delta and United. The flight time is reasonable 14 hours from Australia’s east coast. Harry Potter World is at Universal Studios Hollywood. The theme park is just 20 minutes from West Hollywood, less if you fly on a Nimbus 2000. It is much closer than Disneyland. 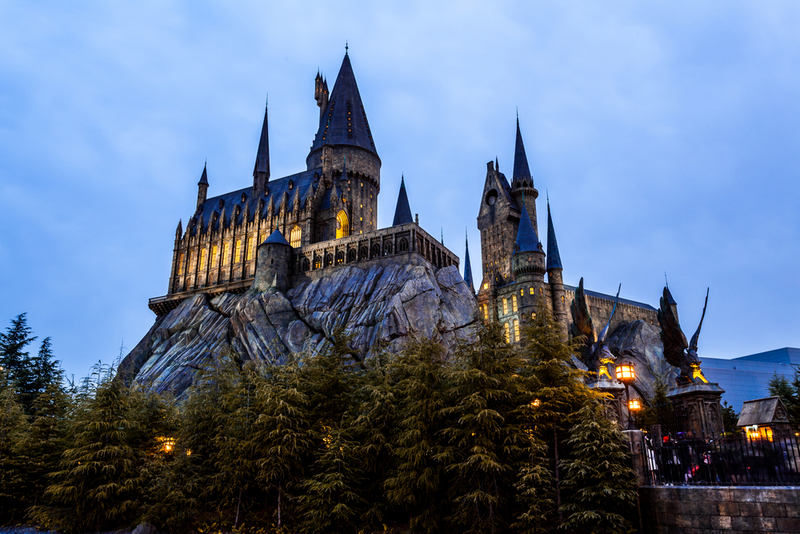 Inside the Wizarding World of Harry Potter California, kids can explore Hogsmeade and Hogwarts and take a ride on the popular Flight of the Hippogriff rollercoaster. 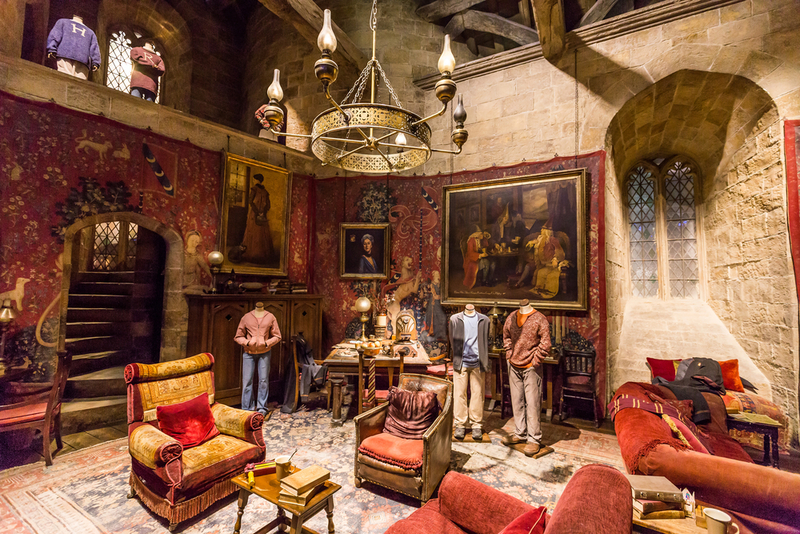 Kids can explore Dumbledore’s office, the Defence Against the Dark Arts classroom, the Gryffindor common room, the Room of Requirement in Hogwarts castle. Kids can buy wands at Ollivanders and cast spells all over the land. Harry Potter World has two new spell locations this year, taking the total number in California to 15. Make sure you watch the Triwizard Spirit Rally. You will see performances from Hogwarts, Beauxbatons, and Durmstrang students ahead of the Triwizard Tournament. Dining options include the Hogs Head and the Three Broomsticks. Butterbeer is essential. We also recommend trying the pumpkin juice. 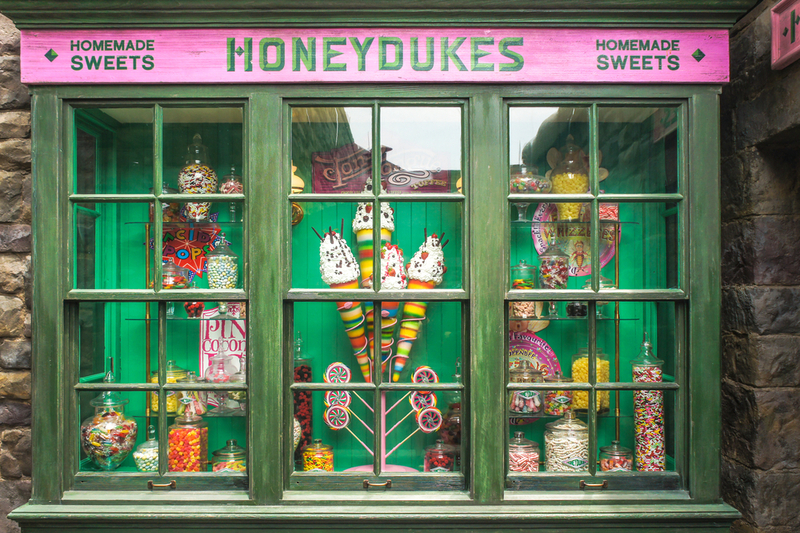 Head to Honeydukes shop for Acid Pops, Exploding Bonbons, Peppermint Toads, Fudge Flies, Fizzing Whizzbees, and Chocolate Frogs. Send a letter via the owl post. Then pop into Zonkes joke shop for gifts and toys. We really love Filch’s Emporium of Confiscated Goods. You can pick up a Marauder’s Map and purchase souvenirs such as t-shirts, jackets bags, caps and plush toys. Harry Potter Wizarding World California has two thrill rides – Flight of the Hippogriff and Harry Potter the Forbidden Journey. Both of which we have already details in the other parks. These are the same rides as in Osaka and Orlando. Harry Potter World officially opens at 10 am. However, you can get an early entry from 9.30am. Once again, get the express pass. It is worth the money. Lines at Harry Potter World can be long. You can also purchase VIP passes to Universal Studios California. 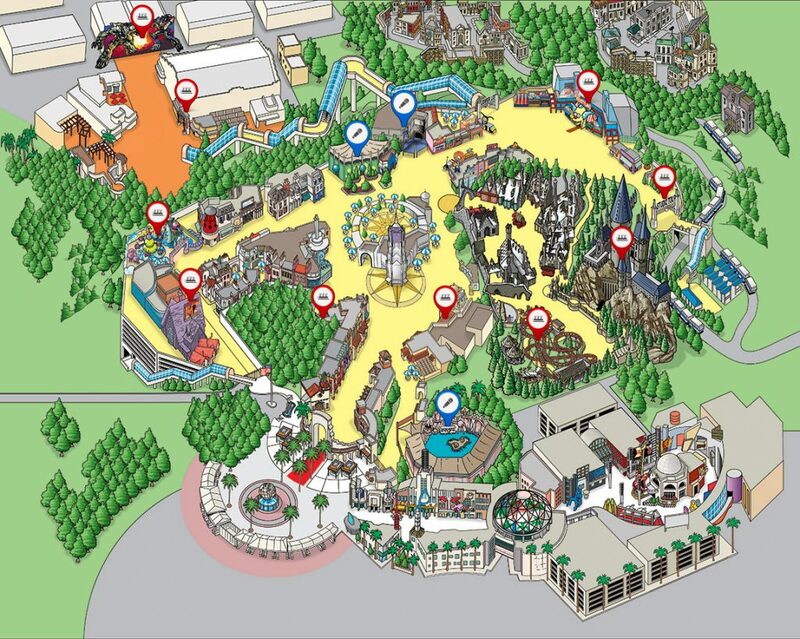 This gives you a VIP tour guide, breakfast, lunch as fast pass access to every ride. Plus, the guide knows the shortcuts through the park. Yes, London does have a Harry Potter attraction. But this is a studio tour. You can’t ride the Hippogriff or Harry Potter the Forbidden Journey in London. It’s actually called Warner Bros. Studios Tour London – The Making of Harry Potter. And it’s not really in London. It’s in Watford. That’s about 40 to 50 minutes drive north of Westminster. Most tours from London will include transport to Watford. This tour takes you on the Harry Potter film set. Kids can enter the Great Hall at Hogwarts, wander through the Forbidden Forest and walk down Privett Drive. Our favourites are Diagon Alley and Platform 9 3/4. You can see the props and the costumes from the film series. One of the best parts of this tour is learning about how the special effects and visual effects work in the film. The highlight for the kids will be the green screen. Here they can jump on a broomstick and pretend to fly over London. Film fans can also enter the art department to see their sketches and plans. Adult passes cost 39 pounds, kids 31 pounds. A family pass (2 adults and 2 kids) costs 124 pounds. Children under 4 are free. Sorry kids. This tour does not have rides. 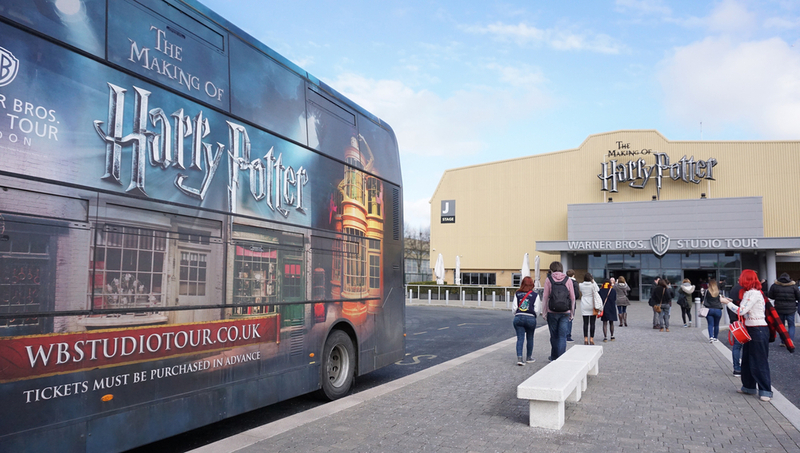 Use the Warner Bros Studio Tours London website to find the best way to travel from your location to the studio. Warner Bros recommends families arrive at least 20 minutes before their tour time. All tickets will have a tour time. The tour usually takes at least 3.5 hours. The studio shops have replica wands, clothes and accessories. However, these wands will not trigger any magical effects.